This chessboard is 11 3/4” square. Over all the board is 17 ¼” square. Each square is just under 1 1/2” and is made with 4 triangles. Two types of wood are in the chessboard. six kinds of wood are on the whole board. The dark square is “Bubinga” from West Africa; the light square is “Hackberry” from Missouri. 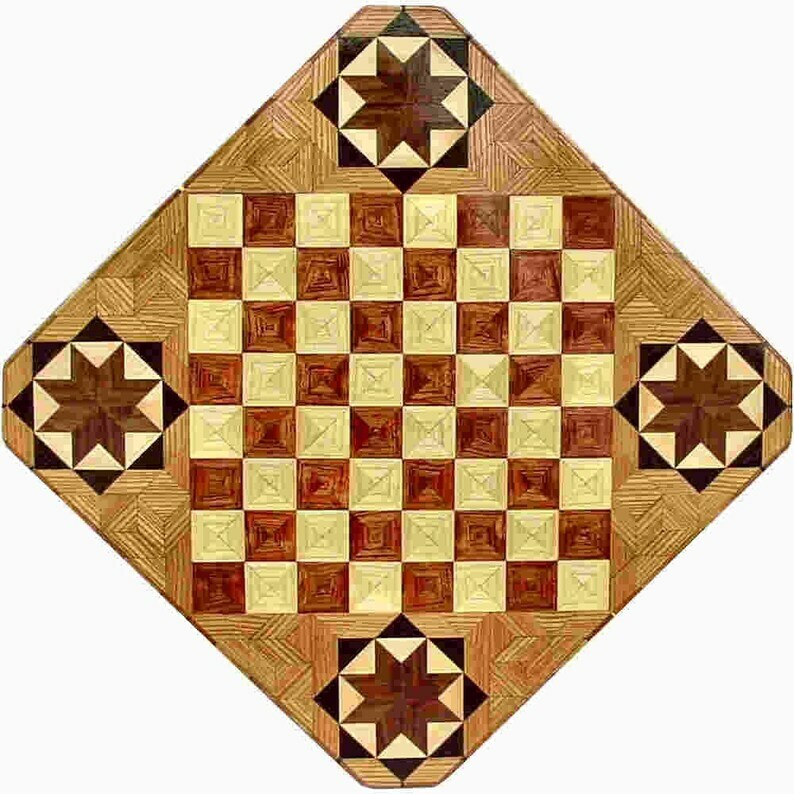 “Elm” from Missouri is around the chessboard itself. The design in each corner is a variation of a “Rolling Star” quilt pattern. The wood on it, from the center of the star is “Walnut” and “Maple” from Missouri, “Wenge” from West Africa and then the “Elm”. There are 560 pieces in the over lay, using 6 kinds of wood. This chessboard is #198 (the number on the back), I made it in 1999. Also on the back, I signed it, listed the wood, and dated it. After the date the words “Foot Cut” let you know I made it on my foot powered table saw. This gives a completely different look to a chessboard. When not being used as a chessboard, it is made to hang on the wall from one corner. They make a very beautiful wall hanging. Go to my ”Shop Polices” and “Profile” page to see my return policy and other information on how I make these. To see other chess boards I’ve made, click on “Game Boards” or whatever gets your interest under “Sections in this shop”. The “Home” page itself can be rather confusing with everything mixed up. The “Sections in this shop” lets me show you all like items together as a unit.